What's better than one of the most popular mid-size sedans that offers greater comfort and room for lengthy commutes? One that keeps you connected to the world and keeps you entertained along the way. Loaded with features, Dodge Charger features a media hub complete with USB ports, auxiliary input jacks, and the ability to sync all of your media files with the touchscreen. There's also a 12-volt power outlet that's perfect for keeping your devices charged while you're on the road. Use hands-free-calling, voice prompts and commands for radio courtesy of Uconnect Voice Command. You can also stream music wirelessly from a compatible media device with Bluetooth Streaming Audio. Would you like to see for yourself? 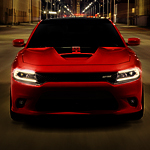 To see Dodge Charger in person, come on down to Findlay Chrysler Dodge Jeep Ram, where we'll be happy to give you a closer look.